You are here: Home / Parenting / Santa’s Toy Bag: You’ll love this new Christmas tradition! 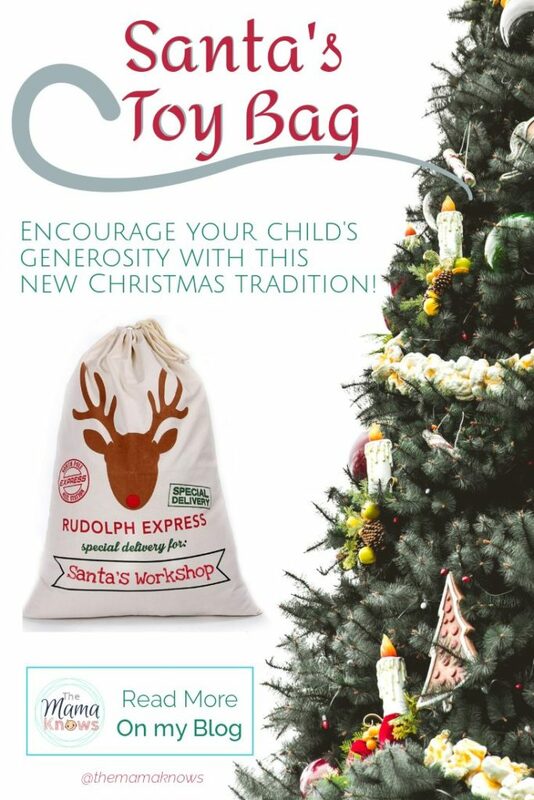 Santa’s Toy Bag: You’ll love this new Christmas tradition! Do you find yourself saying “But they don’t need anymore toys for Christmas!” Just like I do each year? We’ll this new tradition might be worth looking into! 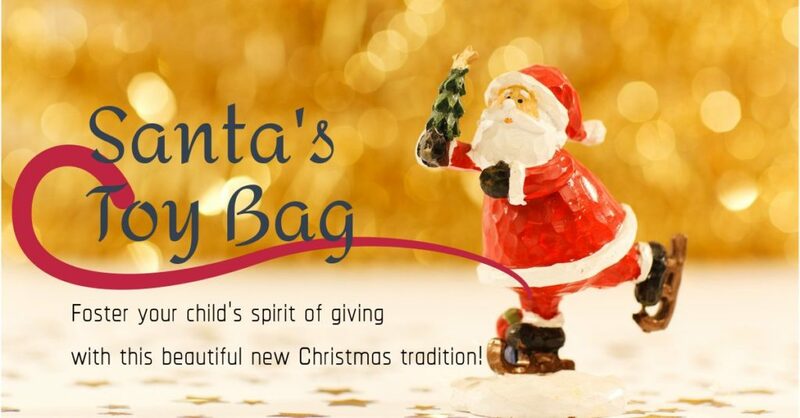 It’s called Santa’s Toy Bag and basically, you just fill a bag up with toys that your children no longer need and send it off to Santa’s workshop where he and the elves can spruce them up and give them to other children! This post contains affiliate links. I earn a small commission from your purchases, at no extra cost to you. This helps support my little blog and keeps me going. Of course, the reality is that you’ll be donating these toys to charity or to thrift shops, and disposing of any broken and unfixable toys. But in the process, you can de-clutter your home and teach your children about sharing, and giving to those less fortunate. If the toys are in good shape, then they can be donated. If they are broken, then they sadly can’t be given away but the act of collecting broken toys can remind your children about the importance of caring for their property. It’s a great way to teach some life lessons like generosity, responsibility and appreciation of how much they really have. And it might just inspire you to think outside the box with your Christmas shopping this year. The first time you gather all your children’s toys can be eye opening. For us, we realized how much waste we were bringing into the house under the guise of “for the kids.” It made us consider heirloom quality toys for the future instead of cheap, plastic ones. Think about the production materials used and try to switch to sustainable options such as toys made from recycled items. This bag from Amazon would be perfect! 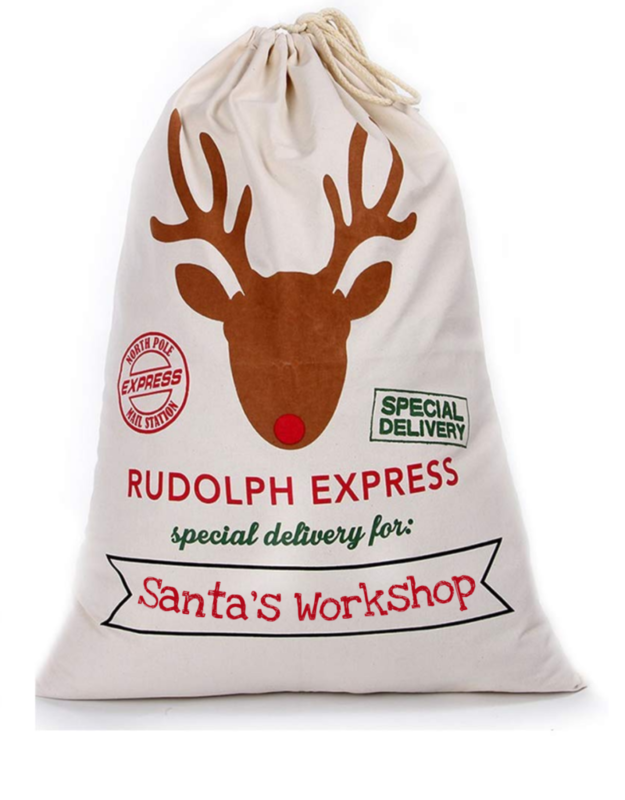 I’ll be using a Size Two AppleCheeks sac for my toy collection this year, but Amazon has this beautiful and affordable sack that you could personalize by writing “Santa’s Workshop” on it. Afterall, Santa is the greatest toy maker on the planet and he can surely fix your broken toys. I’ll put the broken ones on the bottom, and the ones suitable for donations at the top so that I can easily distinguish between the two later. You can pick up a size 2 AppleCheeks sac from Calgary Cloth Diaper Depot, Lagoon Baby, Cloth Diaper Kids or Diaper Junction. They retail for $23.99 cdn and are fantastic cloth diaper wetbag or laundry bags for the rest of the year. Carry Me Mommy and The Baby Footprint also stock these great AppleCheeks size two drawstring sacks. When the kids are in bed, it’s time to wash and prep all the toys for donation. Replace batteries and be sure everything is working before donating the items. If the toys are damaged in any way, you’ll have to toss them. I prefer to take my donations to the Salvation Army, as it’s easily accessible and they used the money earned from selling them to fund their programs. You could also consider Once Upon A Child or Value Village, as well. While they aren’t a charity persay, they are still affordable places to shop for families looking to buy Christmas presents on a budget. This article I found has some great ideas for places to donate your toys that you collect in Santa’s Toy Bag. Some I hadn’t considered are Hospitals and Doctors Offices. Ronald McDonald House also accepts gently used toys (and video games and DVD’s!) For their families to use during their stay. There’s one here in Calgary and there are others across Canada and USA. The first time you do the Santa’s Toy Bag tradtion, you’ll probably end up with a big pile of broken plastic junk. I did. I hadn’t realized how much dollar store toys we’d picked up for the kids, or how badly they’d damaged some of their previous Christmas and birthday presents. I decided to rethink the type of gifts I was going to buy them from now on. No more dollar store, unfortunately. It also meant that Christmas gifts were numbering much less than usual. I chose pricier items that I knew would last. These are called Heirloom Quality and are generally made out of wood or sturdier recycled plastics. Here’s some great ideas from Lagoon Baby and Carry me Mommy! Handmade items like clothing or toys are great too. Consider supporting local artisans and purchase some crocheted items! Christmas is also a great opportunity to give non-tangible toys like Zoo Passes, Science Centre Memberships, Dance or Karate Lessons. You can type up a certificate and give these with a small stuffed animal or toy that represents the gift (like a stuffed lion for the Zoo, or Ballet Slippers for dance lessons). Instead of a large numbers of cheap toys, go for Quality over Quantity. You just might be surprised what you come up with! I’d love to see this Santa’s Toy Bag tradition become more popular. Please consider sharing my post with your friends and family and also pinning it on Pinterest and other social media. Of course, I’d love to hear your thoughts in the comment section as well!